Former Malta and Sliema defender Alex Gollcher. It is always sad to write obituaries. It seems that when one of our old football heroes departs, a part of me dies with him. It certainly felt so after the demise of Alex Gollcher who passed away last week and with him died a lot of what is fine in Maltese football. Modern football has become a means of getting rich, easily and quickly. A few, however, still played the game for the fun of it. One such person was Gollcher – a man who gave a lot to the game but never took a penny back. A born and bred amateur in the true sense of the word, he never succumbed to the temptations of the game. In his days, his name was enough to symbolise honesty and sportsmanship. Gollcher was a true gentleman and a fine footballer in his own right. He started as a right-back although he was a natural left-footed player but in those days, Sliema Wanderers were well served on the left by Lolly Cuschieri. Later on, however, Gollcher moved into the left-half position where he soon established himself in Sliema’s star-studded team of the fifties and early sixties. Gollcher, born in Sliema on November 8, 1929, was a man of few words but he was a great captain, modest and led by example. He started playing in 1943 at the Lyceum and the following year, he joined Victory Tigers in the Associate Members Cup and Msida Wolves in the Associate Members League. 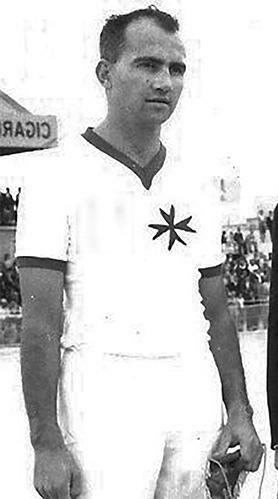 In 1946-47, he signed for Valletta Minors and his fine displays earned him a place in the MFA Minors XI. The next year Gollcher joined his home club Sliema. During this period, he was also a regular player for the Banks FT which, in those days, was a prominent member of the Malta Sports Association. Soon, Gollcher was playing in Sliema’s third and second strings. He made his debut for the first team on November 7, 1948 against Luqa St Andrew’s in the league. It was Gollcher’s only first-team match that year but it was enough to earn him his first league medal. In 1950-51, he was included in the FA Trophy final against Hibs. Gollcher played a steady game at full-back, helping the Wanderers to beat Hibernians by five goals to nil. Between 1948 and 1961, Gollcher chalked up more than 130 first-team appearances for the Wanderers, most of them as captain. Under his leadership, the Blues won 13 major honours. These included the championship in 1948-49, 1953-54, 1955-56 and 1956-57, and the FA Trophy in 1950-51 and 1955-56. Gollcher also helped the Blues to win the Cassar Cup and Scicluna Cup on three occasions. He never sought the limelight and many still rank him among the most under-rated defenders in our game. Time and again he was ignored by the national team selectors and he was only called up for national duty a couple of times. In 1959-60, he finally received recognition when he was chosen to lead the Olympic team in the 1960 Rome Olympics qualifiers. Gollcher retired in 1961 but a year later he was persuaded by Melita to help them in their bid to win promotion to the First Division. Under his guidance the Amateurs won the Second Division. At the end of season 1962-63, however, he retired from all football activities.